Make a small book shelf, mobile book cart or book browser the focal point of the reading center. A book cart with slotted or slanted shelving is ideal, because it's easy to prominently display and organize books on it. Slotted or slanted shelving is more accessible to little ones than a deep book bin or flat shelving. Arrange soft seating, such as oversized pillows, bean bags or cubes, around the book cart. This gives the reading center a cozy, safe feel. Studies have shown that comfortable seating promotes student focus and creativity. Think about using a plush or colorful rug as a way to mark off the area as a quiet, designated learning space. A rug also provides added space for students to lay. 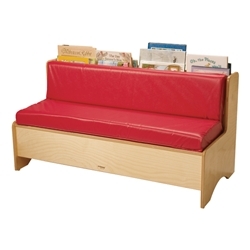 Consider a comfortable reading bench with storage compartments for books and other media. These are a great option if space is limited. A rocking chair is great for kids who need to squirm or expend energy while reading. Use open, colorful bins in your bench or book cart's storage compartments to store stuffed animals, art materials or other supplies you'd like in the reading center. This minimizes clutter and encourages students to keep the area organized. Clearly label shelves and other storage areas for students; make sure all books and materials are visible and within reach. Choose vinyl for any seat or bench padding, as it's durable, easy to clean and comes in a variety of textures and colors.